I used scraps of pre-finished flooring, strong but thin boards, and didn’t bother sanding because the edge was already smooth. The swivel is a lag screw with a big washer. Here’s the finished clamp before installing it. 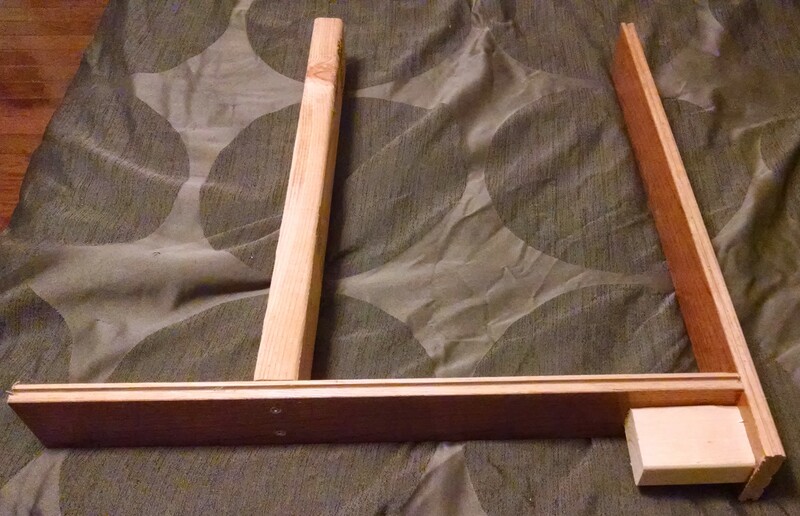 The thicker 2×4 board on the left goes in between the boxspring & mattress. The vertical board tucks into our bed frame and hugs the side of the mattress. 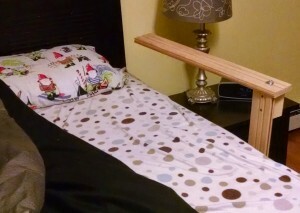 This DIY toddler bed rail was my inspiration for securing the clamp to the bed. You can see in that example that they run the side rail all the way down to the floor. 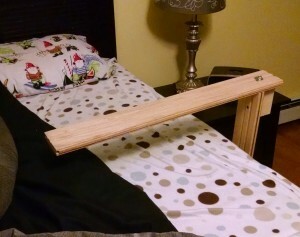 The specifics will depend on your bed frame — mine had enough room to tuck the 3/4″ board in snugly beside the box spring. This entry was posted on Friday, June 5th, 2015 at 10:47 pm and is filed under projects. You can follow any responses to this entry through the RSS 2.0 feed. You can leave a response, or trackback from your own site.